The original WaveOne concept, in most instances, provided a single-file shaping technique, regardless of the length, diameter, or curvature of any given canal. Back when it came to market in 2011, it was shown that a single-file reciprocating shaping technique utilizing unequal CW/CCW angles was over 4 times safer and almost 3 times faster than using multiple rotary files to achieve the same final shape. Now, a new generation has emerged that provides excellent safety, effortless efficiency, and super simplicity, beyond the orginal WaveOne system. This vastly improved system has been branded WAVEONE GOLD. The WAVEONE GOLD system is a single-file and single-us technique. 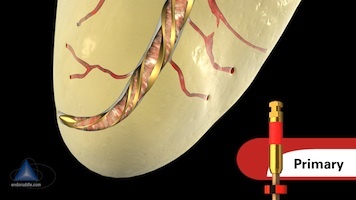 Through the convergence of an advanced design, Gold-wire technology, and a unique reciprocating movement, preparing canals is now safer, easier and faster. 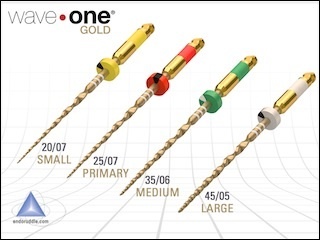 There are 4 WAVEONE GOLD files available in various lengths to more effectively address a wider range of endodontic anatomy compared to its WaveOne predecessor. The 4 files are termed Small (yellow 20/07), Primary (red 25/07), Medium (green 35/06), and Large (black 45/05). The Small 21/06 file has a fixed taper of 6% over its active portion. Each file has a fixed taper from D1-D3, yet a progressively decreasing percentage tapered design from D4-D16, which serves to preserve dentin. For example, the Primary file has diameters of 0.85 mm and 1.0 mm at D9 and D12, respectively, or the length this file typically extends below the orifice during canal preparation. Fortuitously, the Primary 25/07 file is generally the only file required to fully shape virtually any given canal.